Last week Cate and I went on a short adventure to mainland China. 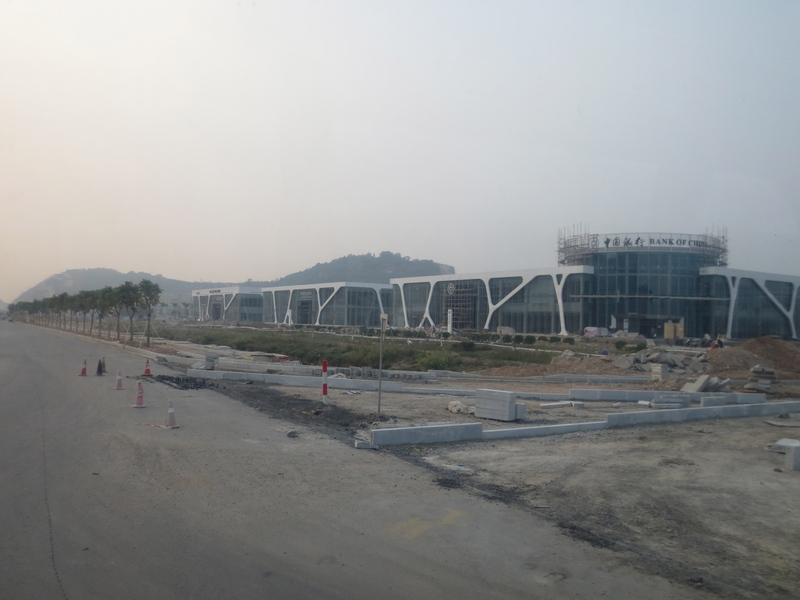 Zhuhai is just across the Pearl River delta from Hong Kong, adjacent to Macau. It’s about a 70-minute ferry ride away. Oh look, here’s a map. The first moment of hilarity was on the ferry ride over. China is well known as a producer and purveyor of fakes—errr, replicas. Copies. Tribute creations. You can’t walk down the main touristy thoroughfares of Hong Kong without offers of “copy watch, copy handbag,” and it’s even more out in the open and ubiquitous in the shopping centers of Shenzhen. 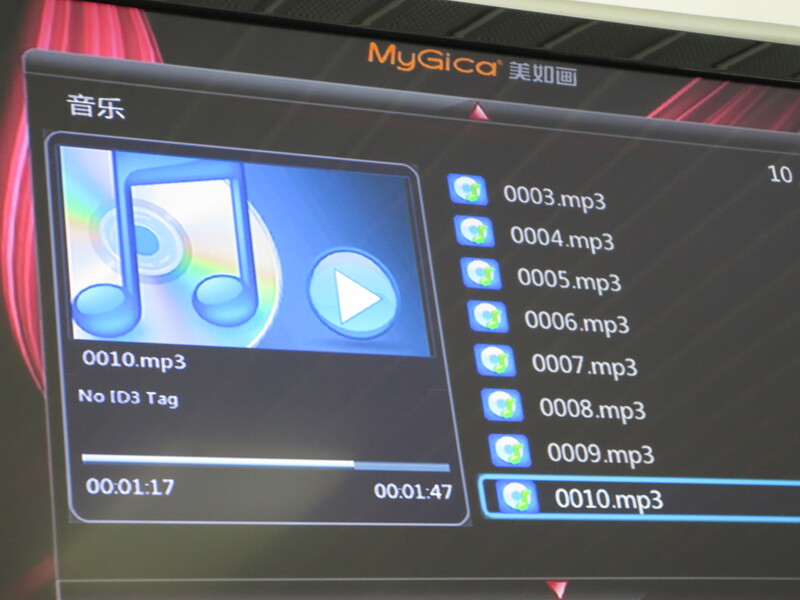 While it’s one thing to see knock-off Louis Vuitton handbags and Rolexes on offer, there’s something extra hilarious about the audio system in the Chu Kong Passenger Transport Co., Ltd.‘s ferry sporting an iTunes logo on its “MyGica” player. We went to Zhuhai so I could help lead a workshop there, but we were also part of a larger group composed of—somewhat improbably—representatives from the Minnesota Private Colleges Council, which has an ongoing relationship with United International College in Zhuhai. 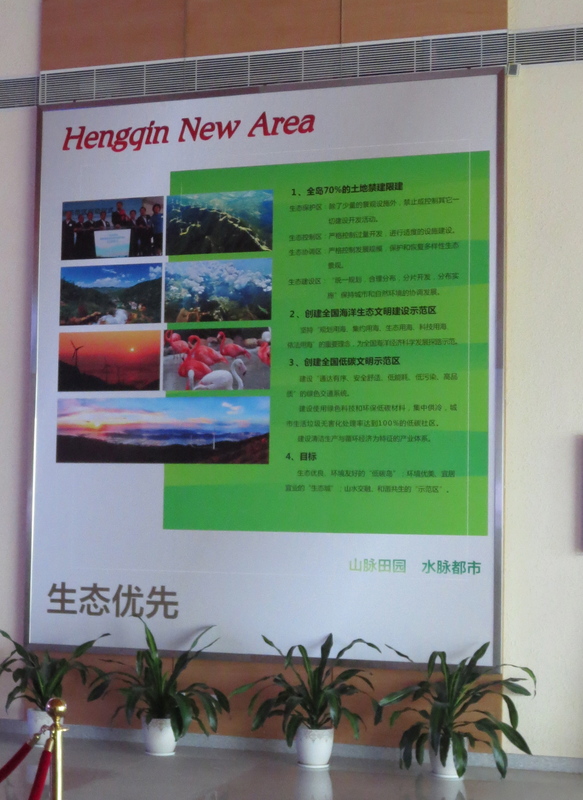 And we were all treated to a tour of the Hengqin New Area. What’s that, you ask? I will tell you. 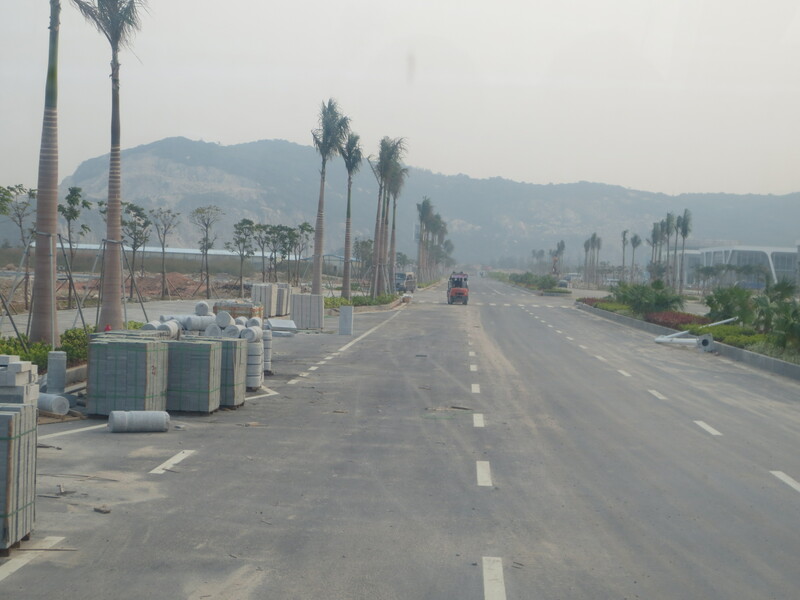 The objective is to convert Hengqin into an open island interconnecting Hong Kong and Macau within 10 to 15 years of 2010. 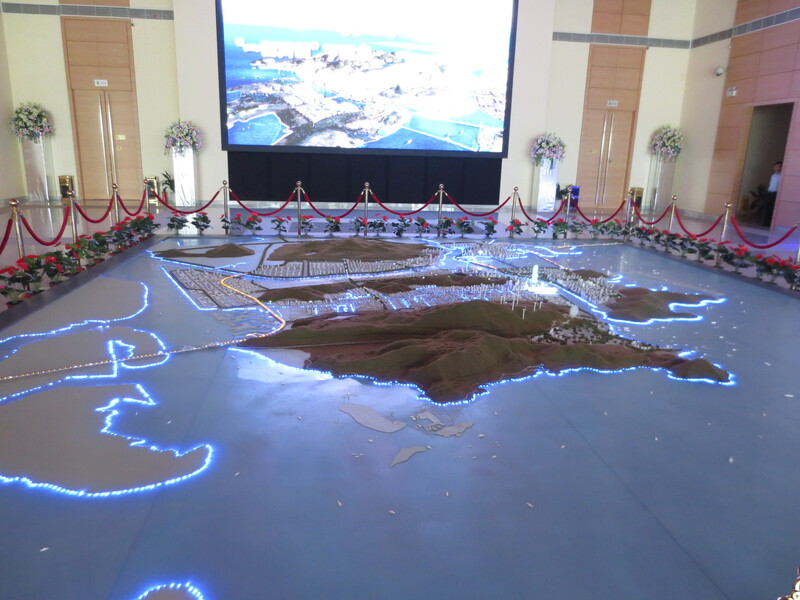 […] It also would become an ecological island with resource and energy conservation plus environmental friendliness. What this means in short is that a large island with a few thousand residents is being completely leveled, rebuilt into a hyper-dense industrial/commercial/residential area of millions. It aims to become an important center of arts, education, culture, and commerce. (You know, like Hong Kong, which already exists, and is less than 20 miles away. I will leave you to speculate on the reasons for this (seemingly redundant) New Area.) It will be linked to Macau and Hong Kong via new bridges, and to Guangzhou via a new high-speed rail line. 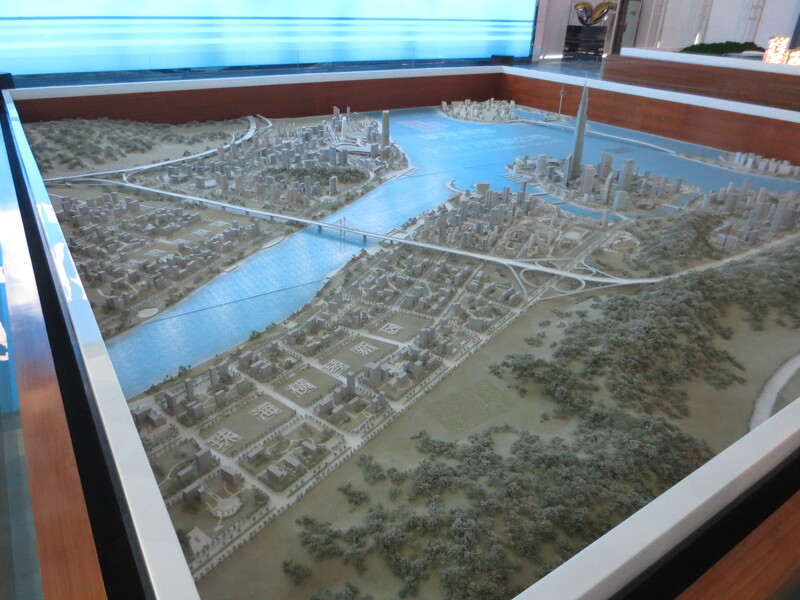 We learned all this and more at the Hengqin New Area exhibition building, located more or less in the middle of the construction. It was one of a very small number of completed buildings and stands amidst a cluster of rubble and dust. “New” doesn’t even begin to describe it. The chief attraction was this large-scale model, which included a number of indecipherable colored lights meant to represent something or other. 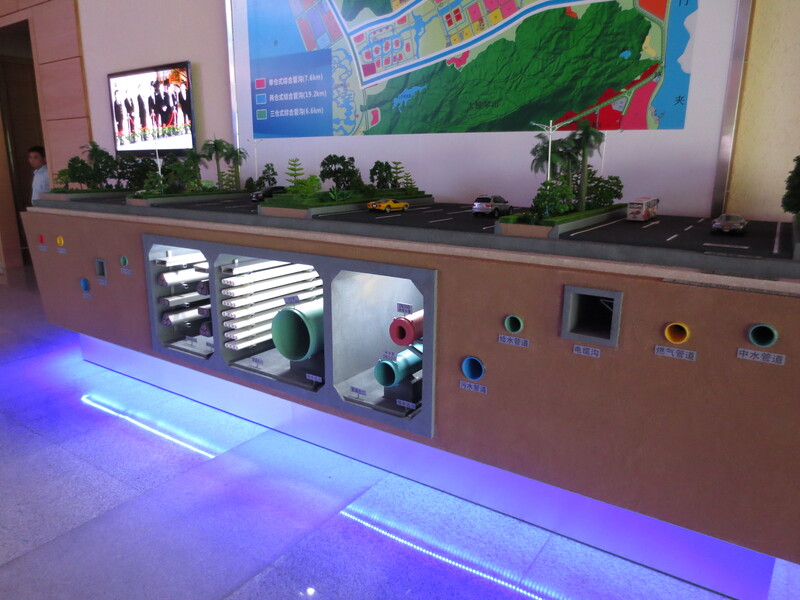 As if the majesty of the entire island landscape were not enough, there was also a model of the utilities infrastructure. Visible pride in the elaborate system of pipes that will provide unsafe drinking water to the thousands of new residents. There was a team of humorless young women standing around, ready to recite a scripted presentation in any language. The spiel included a description of how this New Area was going to be an eco-conscious development, and one that is going to be completed in mere years. These two goals seemed to most of us to be, if not outright mutually exclusive, certainly competing agendas. Eco-friendly development at its finest. All of the natural contours will be maintained, except for those that aren’t perfectly level. 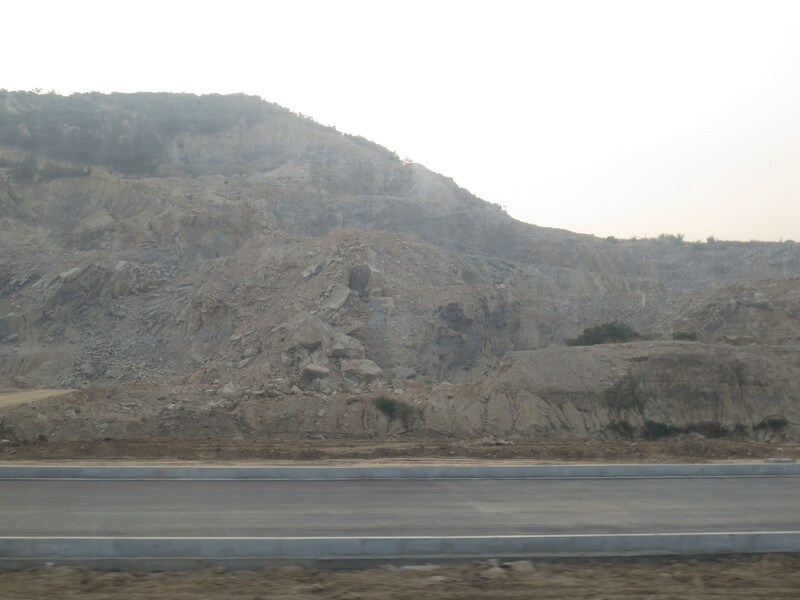 The hillsides that weren’t being leveled—the landfill being necessary to create a peninsula as part of the New Area—were being covered in concrete slabs for reasons never explained. 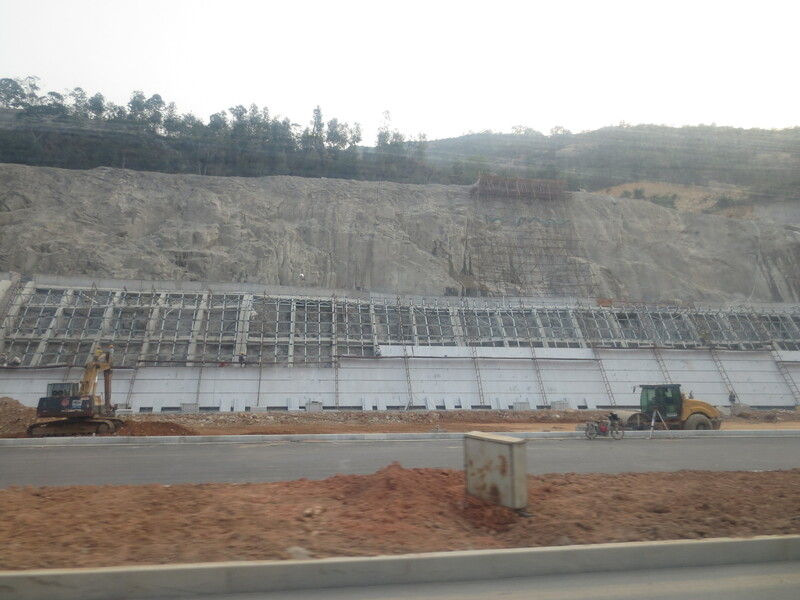 The natural hillside will be carefully preserved for future generations beneath this thick layer of concrete slabs. 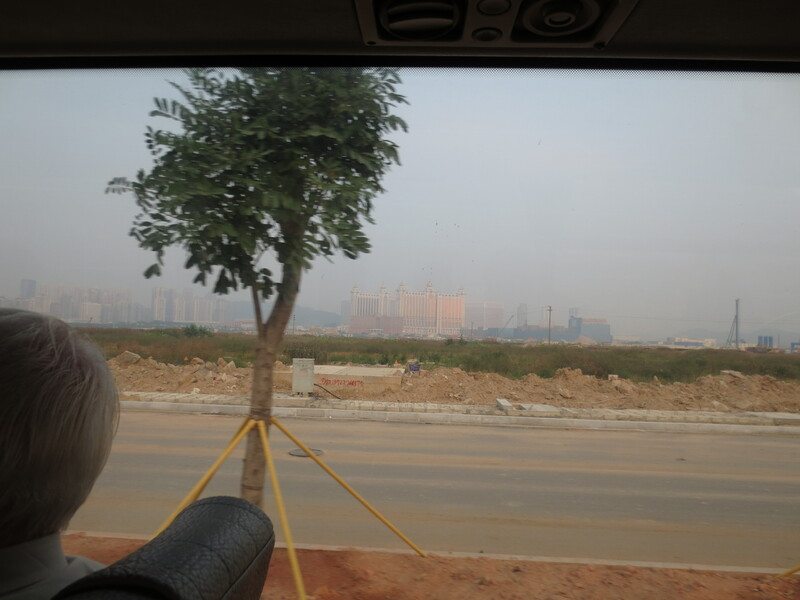 It was striking, though, to look across the road and see the skyline of Macau (i.e., casino after casino) looming. Macau will be easily accessible so that the Chinese nouveaux riches can more efficiently become nouveaux pauvres. And then this photo, which Cate took, is just too good. Note the pagoda at the top of the hill in the foreground, threatened by the encroaching heavy machinery. This would be heavy-handed allegory if it weren’t, you know, really happening. We ended up at what is evidently going to be a banking center. All of the banks will be more or less identical in size and shape, and all have these rather lovely glass walls. Although the New Area is far from complete, and the banking center not much farther along than any other structure, they have decided to put the signs up for each bank early on. It looks like a banking ghost town: rows upon rows of banks, empty inside, with clouds of dust swirling around the glass. Please pardon our dust while we create an entire banking center out of nothing. This photo (of what will soon be the central access road to the banks) gives you a sense of the utter isolation. The beginning of a world looks eerily like the end of the world. There is something oddly impressive about this entire undertaking, as there will—barring any major setbacks—truly be a giant financial/commercial/retail/cultural/educational/residential metropolis where there had been nothing before, all in a matter of years. There will also be a $50 billion theme park at the other end of the Area. No joke. But at the same time, the speed with which this project is being undertaken is cause for alarm. There is none of the regulatory oversight that can stymie similarly large undertakings in the US: no environmental impact studies, no worries about eminent domain, none of that. This is the country, after all, that built a 15-story hotel in 6 days. It was also sad to think about the destruction of this previously un-developed land. 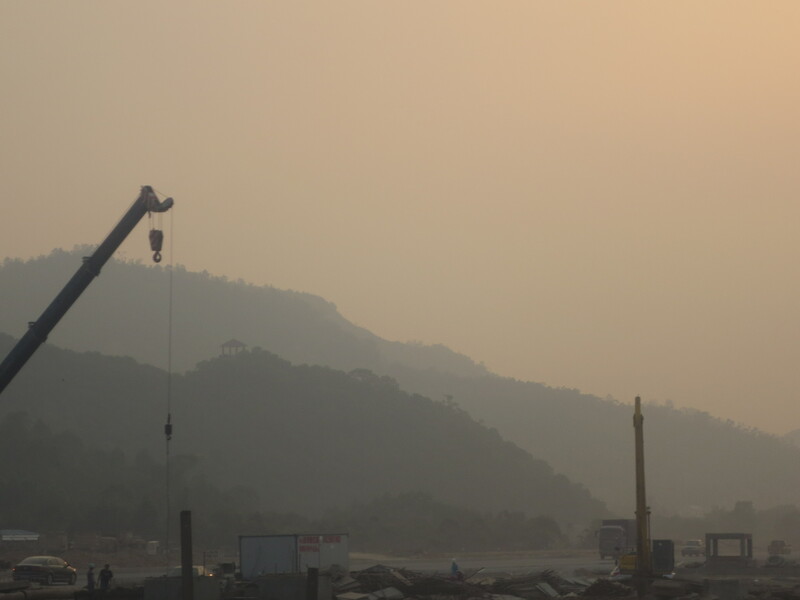 While it’s probably naïve to think that it wasn’t only a matter of time, there is something especially galling to hear that this is going to be “eco-conscious” or a “green initiative.” Nothing says “environmental stewardship” like leveling mountains and pouring the debris into the Pearl River delta. The let’s-do-this-all-at-once approach also affects the overall aesthetic. 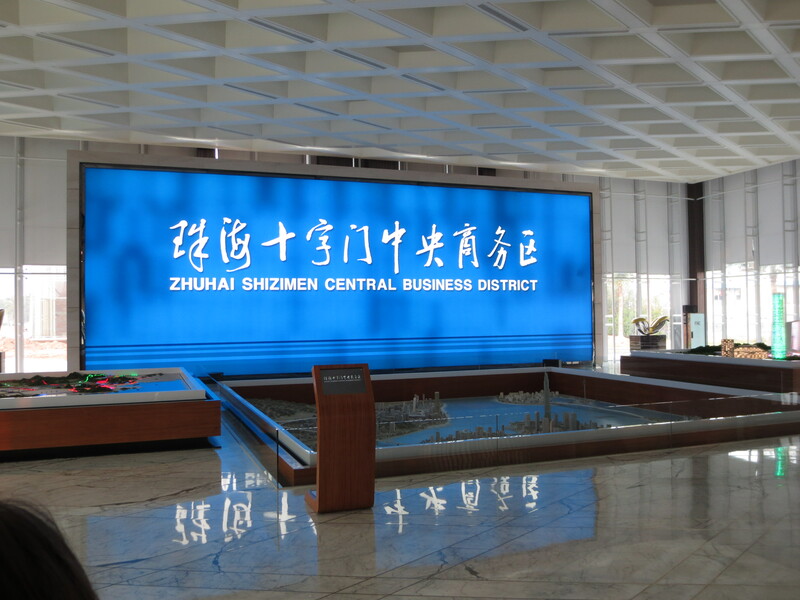 We learned this when we made our last stop, at the showroom for the Zhuhai Shizimen Central Business District, which is just one small part of the vast New Area. It too had an impressive multi-media show. The multimedia presentation was not to be believed. Literally. Here too we heard a spiel from a barely comprehensible docent about all of the fabulous features that would be available to investors and potential residents who Acted Now So As Not to Miss Out. The various sectors of the ZSCBD were already decided on: high-end residential here, high-end shopping there, high-end cultural experiences over there, and so on. We were told with evident pride that the ZSCBD had been designed “by the number-two architectural firm in the world,” although which firm that was and who did the rankings was never mentioned. Spacious 2BR/2.5 harbor views now available, starting in the low 900s! Even if they’d managed to snag the #1 firm (I wonder how they slipped away? ), when you have only a single set of eyes creating an entire metropolis, oppressively dull homogeneity is inevitable. The area is clearly thought-out, but it has all the charm of a gigantic McMansion. In fact, the more I think about it, the more the entire thing seems like Sudden Valley.